Showy American native plant with brilliant blue-violet flower spikes and a majestic, upright growth habit. Its called false indigo because it was historically used as a substitute for expensive indigo tinctoria as it produces a similar dye. Roots were used by Amerindians as a purgative, emetic, and anti-inflammatory remedy. Recent research has observed False Indigos immunostimulatory actions. Patience is key with this plant, as it can take up to three years for flowers to appear! Needs very little maintenance and is resistant to most pests. 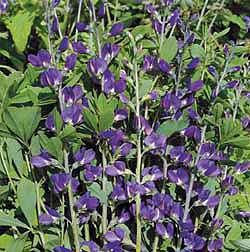 False Indigo will root deeply and once established, should not be relocated. It is considered to be one of the most adaptable native species as it tolerates poor soil and drought as well as a wide range of hardiness zones. Plant in full sun to part shade; requires at least 6 hours of full sunlight. Ht 3-4ft (90-120cm).